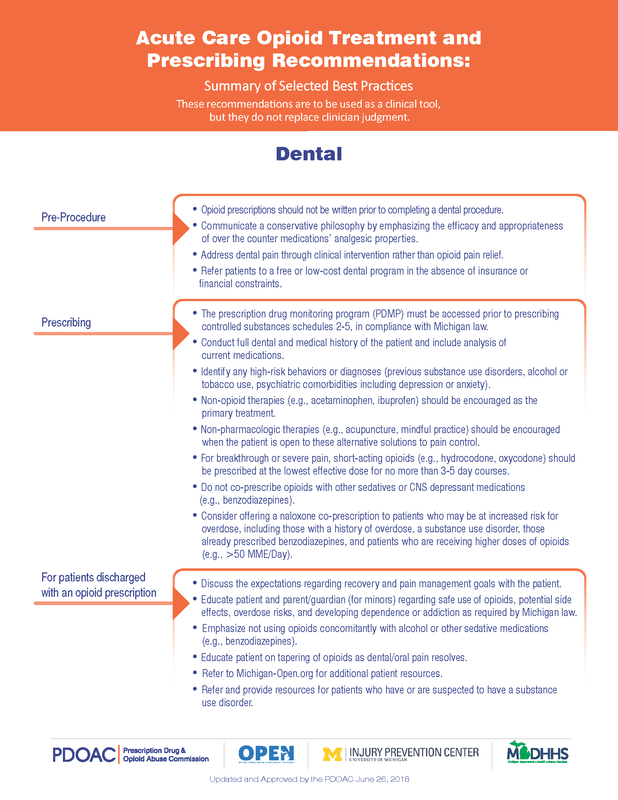 This handout provides prescribing recommendations from the Prescription Drug and Opioid Abuse Commission (PDOAC) for dentists. These recommendations are a summary of selected best practices and are to be used as a clinical tool, but not as a replacement for clinician judgment. The recommendations will assist dentists in treating patients throughout each phase of treatment: pre-procedure, prescribing, and post-procedure (for patients discharged with an opioid prescription). 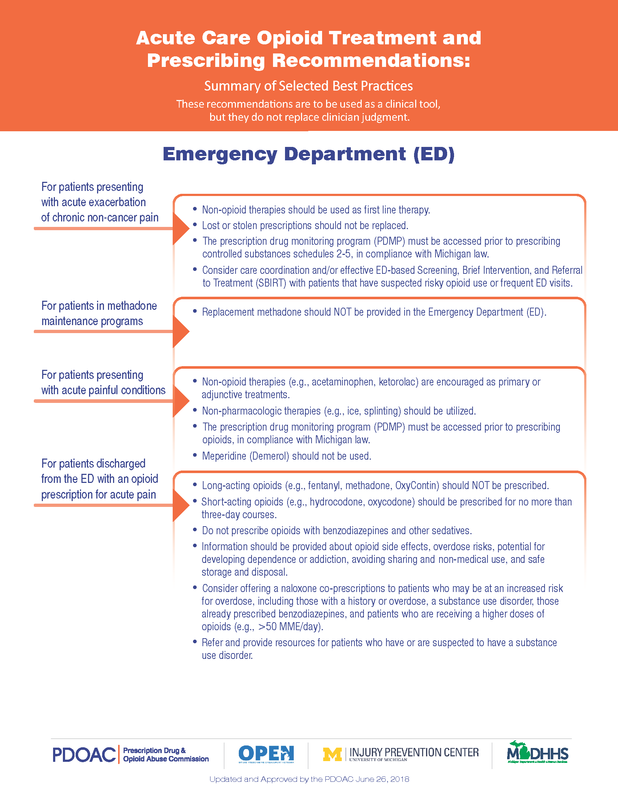 This handout provides prescribing recommendations from the Prescription Drug and Opioid Abuse Commission (PDOAC) for the emergency department (ED). These recommendations are a summary of selected best practices and are to be used as a clinical tool, but not as a replacement for clinician judgment. The recommendations will assist ED physicians in treating and prescribing patients presenting with acute exacerbation of chronic non-cancer pain, patients in methadone maintenance programs, patients presenting with acute painful conditions, and patients discharged from the ED with an opioid prescription for acute pain. 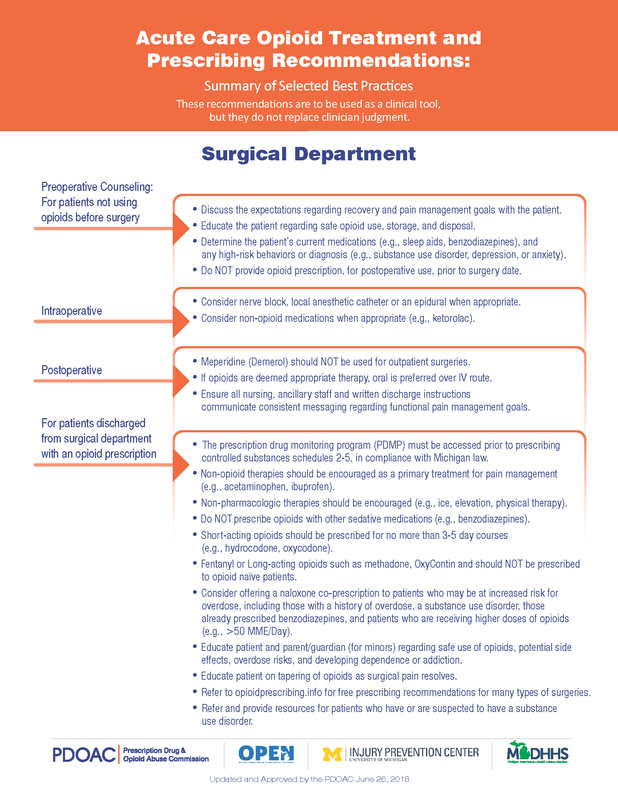 This handout provides prescribing recommendations from the Prescription Drug and Opioid Abuse Commission (PDOAC) for surgeons. These recommendations are a summary of selected best practices and are to be used as a clinical tool, but not as a replacement for clinician judgment. The recommendations will assist surgeons in preoperative counseling (for patients not using opioids before surgery), intraoperative and postoperative care, and post-discharge treatment (for patients discharged with an opioid prescription). CDC’s National Center for Injury Prevention and Control funds 10 Injury Control Research Centers (ICRCs). These centers study ways to prevent injuries and violence and work with community partners to put research findings into action. 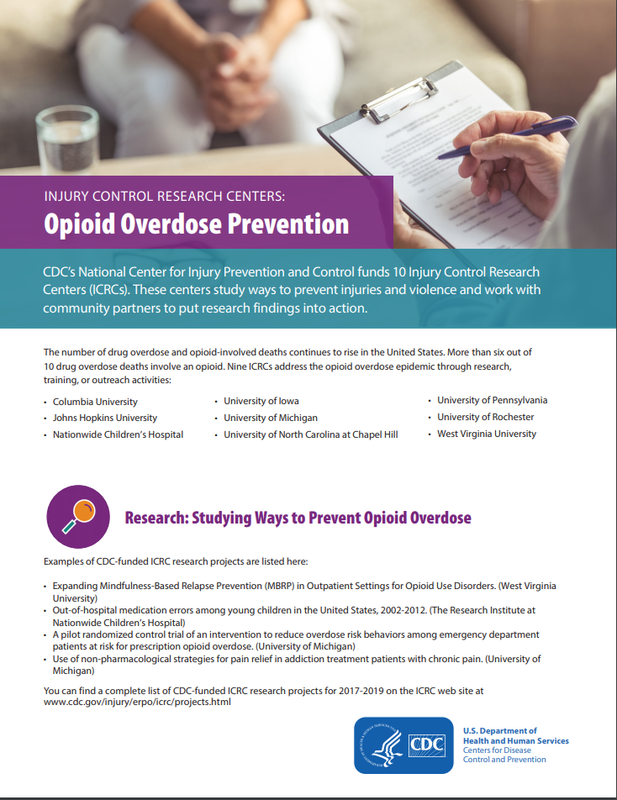 This handout outlines how the Centers are impacting Opioid Overdose Prevention. 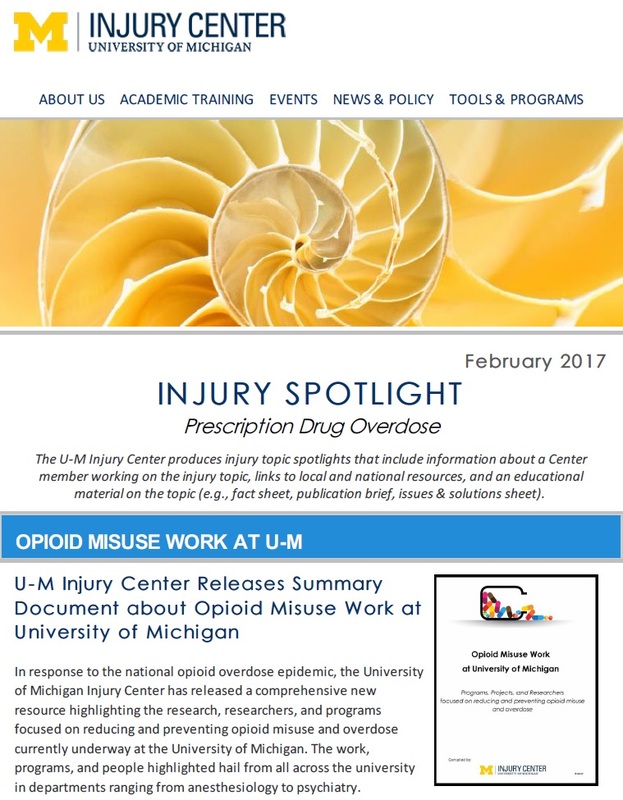 The University of Michigan Injury Prevention Center plays a crucial role in working with community partners to put opioid overdose prevention research into practice. Learn more here. 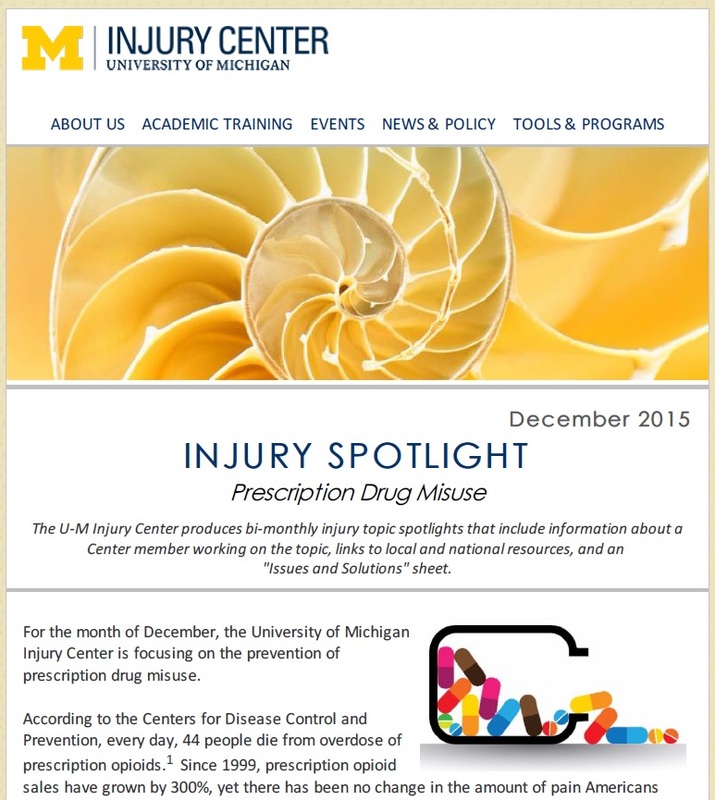 This handout provides Prescription Drug Overdose information including links to state and national resources, a summary of opioid misuse work at the University of Michigan, and a member profile on Dr. Jennifer Waljee. This document provides information on an evidence-based program to combat the opioid overdose epidemic. 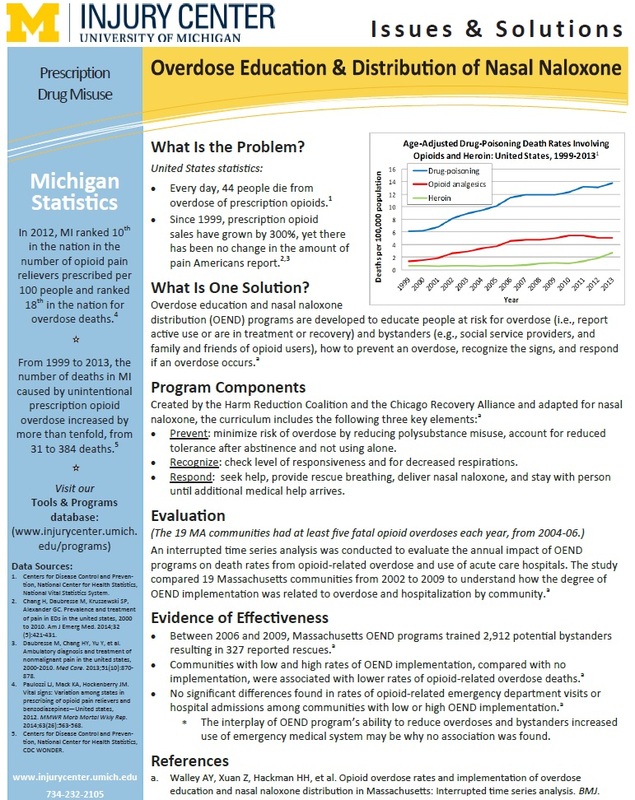 This handout gives information on the opioid overdose epidemic, information on the highlighted evidence-based solution and the components of the program, and the evidence for the program’s effectiveness.